The coffee you grab on the way to work may contain up to a fifth of your daily recommended calories, a study says. Some of those tested by Which? topped the scales at almost 400 calories. Researchers said lashings of full-fat milk, cream and chocolate are the culprits with a skimmed milk cappuccino weighing in at fewer than 30 calories. The consumer group also found that a burger would be a healthier option than some coffee house snacks after testing products from three leading chains. They found that one mocha coffee made with full-fat milk added up to 396 calories, and the same coffee with semi-skimmed milk - but topped with whipped cream - contained 326. The variation between different shops was notable, with the full-fat mocha, cream and chocolate flake from the third branch containing less than 300 calories. A black coffee contains virtually no calories - an "Americano" tested at one shop had 17. But even plumping for skimmed milk makes a massive difference, say Which?. 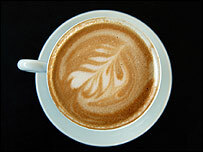 One skimmed milk café latte tested contained 71 calories, while a "skinny" cappuccino, with more froth and less milk, had only 27. The sandwich and cake counters in coffee shops were not the refuge of the healthy eater, either. While rich chocolate cake slices, predictably, contained more than 600 calories each, even less obviously rich food would pile on the pounds if eaten regularly. One "fruity flapjack" had a calorie-count of 423, while a cheese and pickle sandwich in another chain topped 500 calories. The report said: "You might be surprised to know that some coffee shop sandwiches contain more calories, fat and salt than a McDonald's Big Mac." In the UK, the recommended daily calories for women is 2,000, and 2,500 for men - and a combination of coffee and snack could account for more than half of that allowance. A spokesperson for Which? said: "Most of the big chains do have information about the nutritional value of their products on their websites. "But we'd like to see this displayed prominently in their shops, so that customers can see how many calories are in their products." How much is too much coffee? Should a latte be the symbol of modern Britain?